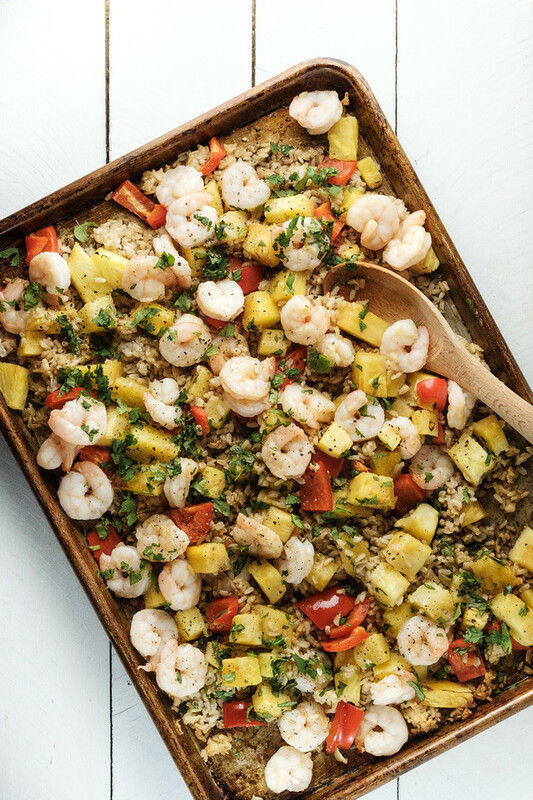 This Sheet Pan Shrimp with Pineapple has all the flavors of a stir fry except that it is made in a sheet pan! 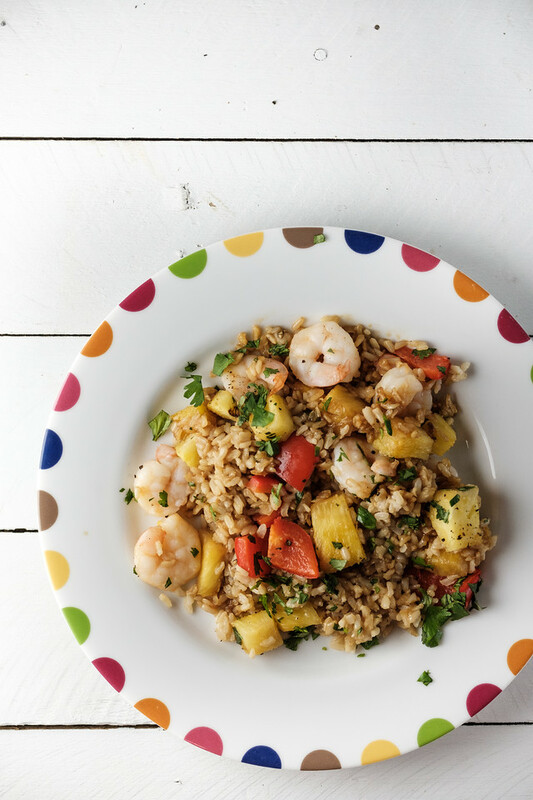 Shrimp, pineapple and crisp red bell peppers roast atop rice in this easy dinner! You may never stir fry again! Click here to pin this Sheet Pan Shrimp with Pineapple now! I love to stir fry. I love having all my ingredients chopped and ready to go. Oil heating up in the wok. 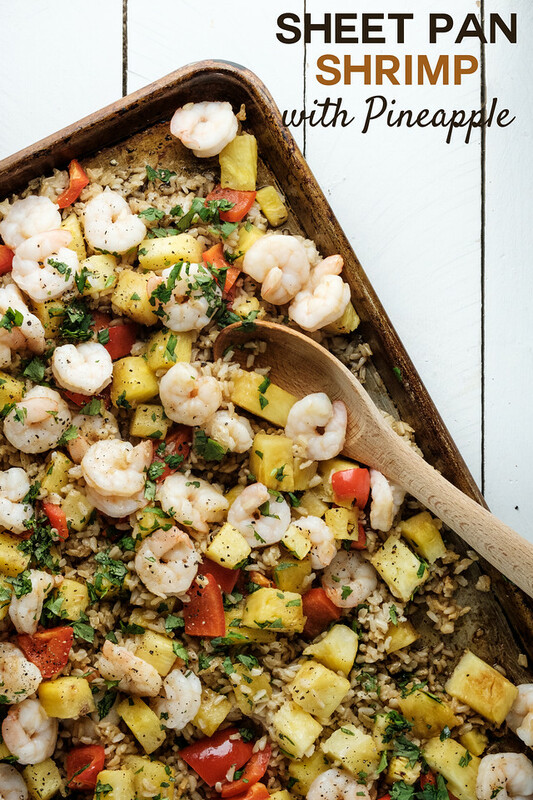 But when I saw this recipe for Hawaiian shrimp in Cooking Light, I was intrigued. It sounded so good. Shrimp, red bell peppers, bright yellow pineapple. If nothing else, I knew it was going to be colorful. Best of all, it sounded crazy easy. Stir frying isn’t difficult, but it’s pretty hands on. Standing and stirring, tossing, adding the next ingredient, tossing some more, careful that it doesn’t burn. This recipe is so crazy easy! You preheat your oven with the baking sheet in the oven. Then you bring it out and add leftover rice and bake for 5 minutes. Then you top it with pineapple and red bell peppers and bake for 5 minutes, after that you top it with the shrimp and bake for a final 5 minutes! You make a quick sauce of soy sauce, brown sugar, rice vinegar and pepper, while the shrimp is baking, and drizzle that over the top! This sauce is so good! See what I mean? Crazy easy and oh so good!! This was so good! Made even better by how easy it was! The instructions tell you to mound up the rice a bit to make sure it’s all covered by the other ingredients, otherwise it will get too crispy. I sort of did that, but I also really liked the rice that got extra crispy! So, you might want to try it and see what you prefer. Also, the ingredients call for precooked Jasmine rice, to make it even healthier, I used leftover cooked brown rice. I am a huge fan of one pan dinners. Especially one like this that includes a grain, a protein, a vegetable and a fruit! This is definitely going into regular rotation around here! 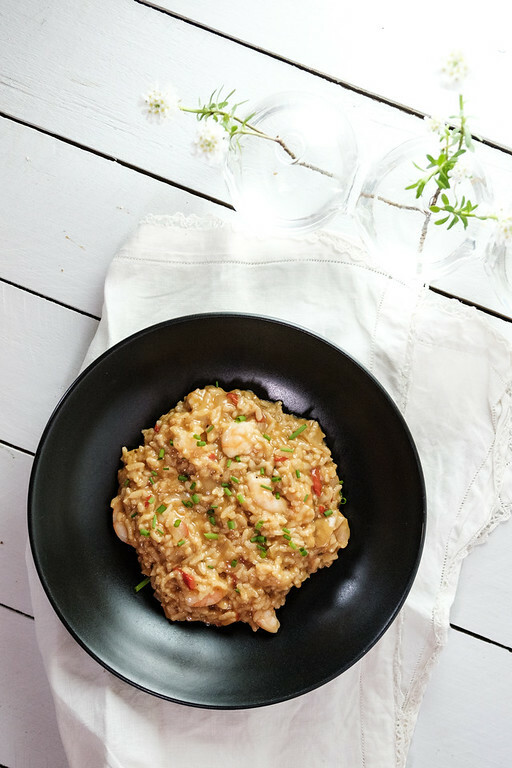 Another easy one pan shrimp recipe is this Instant Pot Shrimp Risotto! 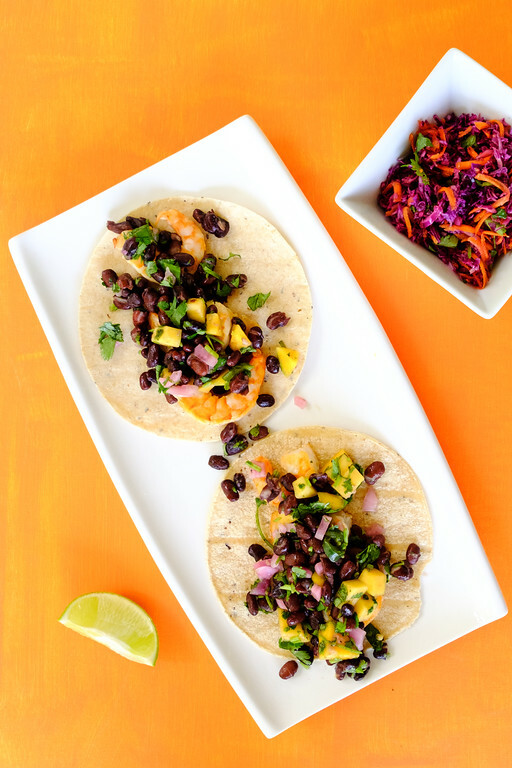 Just as easy are these Shrimp Tacos with Mango and Black Bean Salsa. 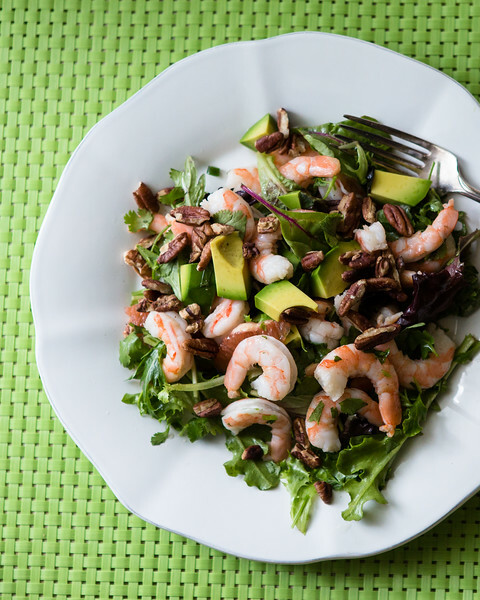 You’ll love the easy year round shrimp salad – Shrimp, Avocado and Grapefruit Salad. This amazingly easy sheet pan shrimp dinner will become a family favorite! Preheat oven to 450 with a rimmed baking sheet in the oven. Place rice in a bowl, add the oil and break up the clumps with your fingers. Coating the rice evenly. Remove pan from oven and spread the rice in an even layer in the center of the pan. Bake for 5 minutes. Remove the pan, stir and top with pineapple and red bell pepper. Bake for 5 minutes. Remove the pan and top with the shrimp. Bake for about 6 minutes. While shrimp is baking, place the soy sauce, sugar and vinegar in a microwave safe bowl. Microwave for 45 seconds. Stir with a whisk to dissolve the sugar. Drizzle sauce over the pan. Sprinkle with black pepper. Toss. Serve, sprinkled with the fresh cilantro. How much shrimp do you use? The recipe says “1 1/4 large shrimp peeled and deveined” — 1-1/4 pounds? ounces? cups? Oh my gosh, thanks for catching that! 1 1/4 pounds! All those dishes look delicious and one pan meals always grab my attention. One pan are the best! I love that you can make multiple different dishes out of this or just eat it by itself. Perfect for busy days and some comfort food. Love how easy sheet pan recipes are!!! This looks like a great meal for a busy night… which has been every-night for us lately. A one pan cooking is perfect! One pan dinners are the best! Sheet pan dinners are the way to go on crazy weeknights. This looks scrumptious and easy! This looks like the ultimate stir fry recipe! So colorful and bursting with flavor! I was wondering how you cooked the rice on a sheet pan! Now I see to precook it 🙂 This recipe is awesome! I’m really into sheet pan dinners at the moment and can’t wait to give this one a try!